Requirements (external link) REVISED effective January 1, 2015. If a scout comes prepared, this merit badge can be completed during the Pow Wow. Complete requirement #1. Which includes: writing in your ownn words the meaning of sustainability, take notes at a family meeting about what they think sustainability means. Materails from requirement #1. 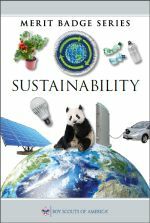 Your written definition of sustainability in your own words and your notes from your family meeting about sustainability.